iWavestation is an absolutely unmissable milestone in mobile synthesis. A powerful combination of wave sequencing and vector synthesis. Easier to program than the original. 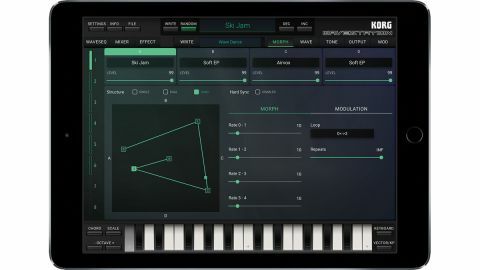 The latest iPad/iPhone classic synth emulation from Korg is the one many fans (us included) have been most eagerly awaiting: iWavestation brings one of the greatest electronic instruments of the ‘90s bleeping and burbling to iOS. Like the hardware it replicates (and it really does replicate every bit of it! ), iWavestation delivers an incredibly powerful combination of wave sequencing and vector synthesis. A ‘performance’ comprises up to eight parts or patches, each housing up to four wave sequences and with its own adjustable key and velocity ranges, enabling layers and splits to be defined. A ‘wave sequence’ is a series of up to 127 sampled waveforms, strung together and played back in series, with detailed adjustment of timing, pitch, sequence start point, looping and wave crossfading. The vector synthesis side of things refers to the mixing of waves or wave sequences via a modulatable Morph path, or by waggling the vector joystick, which is joined by an X/Y performance pad. Then there are the usual architectural systems you’d expect to find - LFOs, envelopes, low-pass filters, etc - as well as more than 50 effects (delays, choruses, phasers and more). The source material is neatly presented across a library of 11 ‘cards’, each containing 50 performances, 35 patches and 32 wave sequences, with 484 waves between them. Investing £4 in an IAP Expansion adds seven cards, bringing the numbers up to 1050 performances, 735 patches, 672 sequences and 780 waveforms.